How about some CONCATULATORY chicken??? HURRAH for all of you!!! Mom Paula saw that bucket outside in the hallway last night! Congratulations on your award. Not to worry Sweet Waffles. Nothing goes better together than fried chicken and Waffles, and we're pretty sure there's not much bigger than your head. (Kidding! Really! We were surprised Katie hadn't said it.). We're so glad the conference was a success for you both. We're thinking a few pink streamers for the Waffles Wagon, maybe? Wishing you a safe trip home. 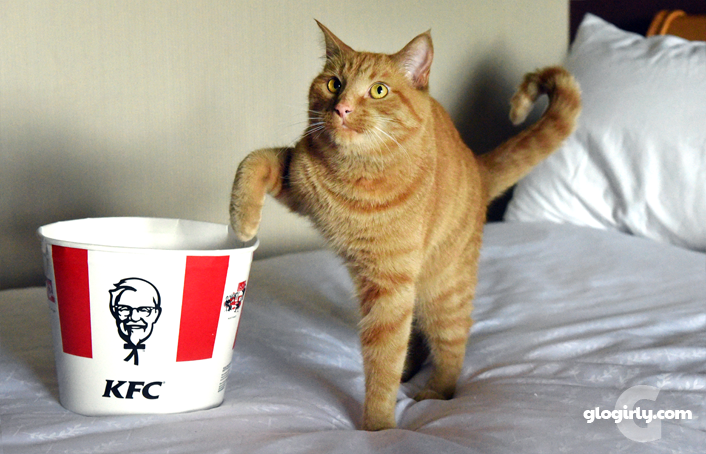 My human and I saw that KFC bucket outside your door, Waffles! We thought it was hilarious right then and there! My human had fun at your party - I hope you do not think I was a snob for not coming. On the contrary, I was worried about territory and scent and trying to respect that and all. Does this mean I'll never be your girlfriend? It's been quite some time since we had KFC (without the coating). We hope that it was yummy. Great pictures! As always. Waffles, you just enjoy your chicken and don't worry what Katie says to put you off. We are very impressed with Katie's travelworthyness. Katie, I bet you will be invited on lots of trips now! Do I take it from the comments that you WON? Very many congratulations then. Congratulations! I'm so happy that you had such a successful conference AND chicken too! MOL! Fun & chickie too!!!! Be safe!!! What a great conference this must have been. I am so happy you allowed those of us who stayed home to travel with you. It has been so much fun? I am still amazed over Katie waltzing through one of the rooms in the stroller. M says I maybe would have left out of the stroller and headed for the nearest door. 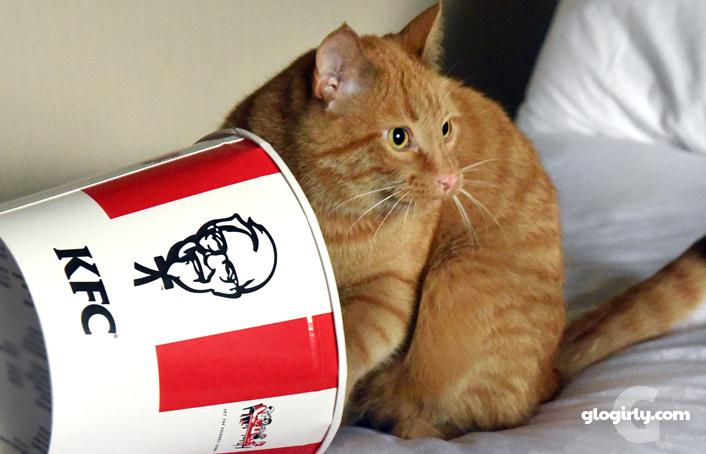 Concatulations on your win and winning that bucket of KFC! Have a safe trip home! Awww we're so glad you met the "Colonel" Waffles! 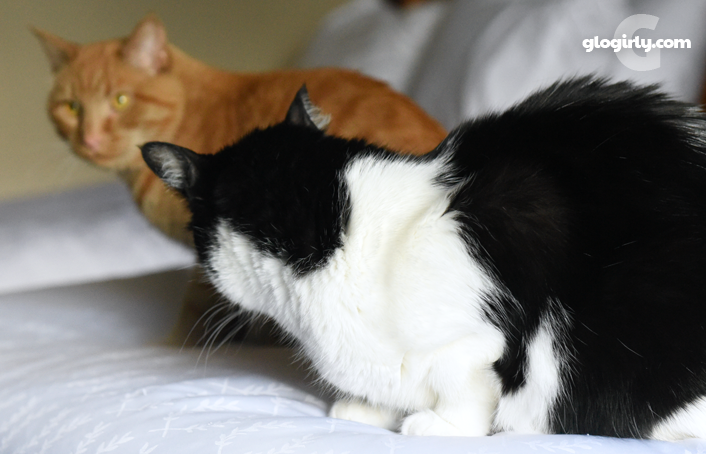 BIG Concats on the Nose to Nose win! Well..I see from the comments that you 3 won an award..Concats to you...I'd say a bucket of KFC and an award means it was a very good day for the Glo family!!!!! Waffles..are you planning a concert on the way home to celebrate??? Chick-hen!! You is a lucky kitty Waffes. 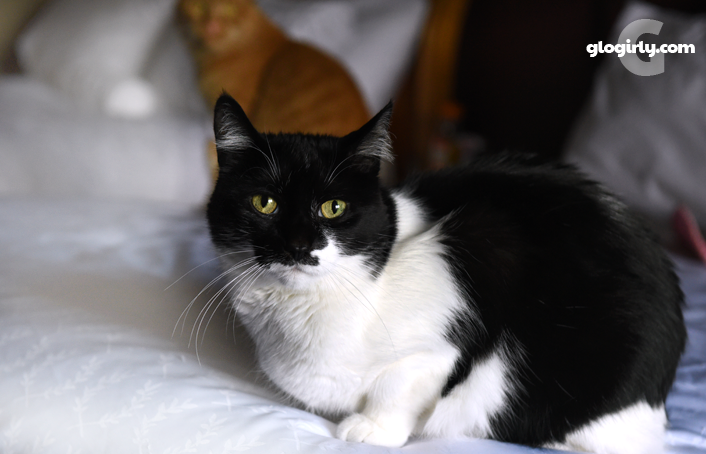 Our mom bean watched the live feed last night and we was all furry excited to see you kitties and Glogirly win the award!. Concats!!! 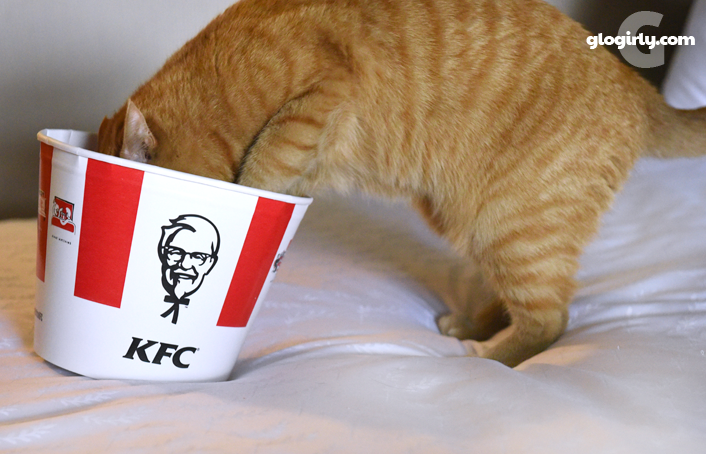 I am sure happy that Waffles loved his KFC chickyum. I can't tell you how many people asked me if that was MY room because they seen the bucket. BOL!! Heaven in a bucket Waffles!!! Concats to all three of you on your success. You got the trophy, Waffles got the chicken...win/win!!! 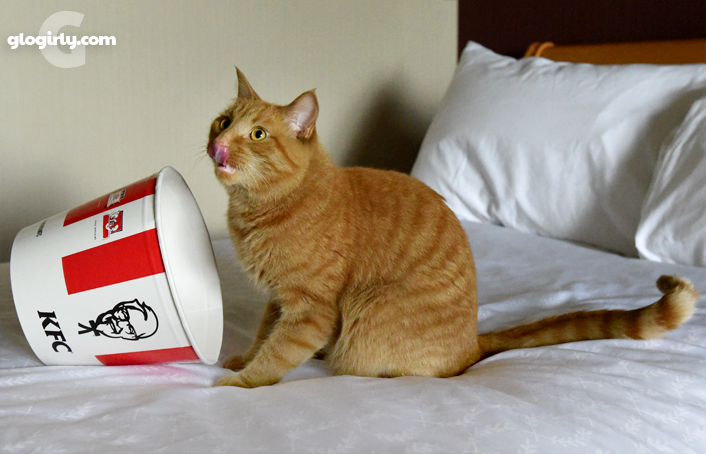 Concats on winning and what better way to cellybrate than with a bucket of chicken. This is the first BlogPaws that we didn't get any KFC. The dad-guy is slippin'. Congrats on your N2N win!! NICE! Team Glogirly/Katie/Waffles had a great BlogPaws! A Nose-to-Nose win AND chicken??? Congratulations, dear friends. We are so proud of you! oh that paw up photo is PRICELESS!! 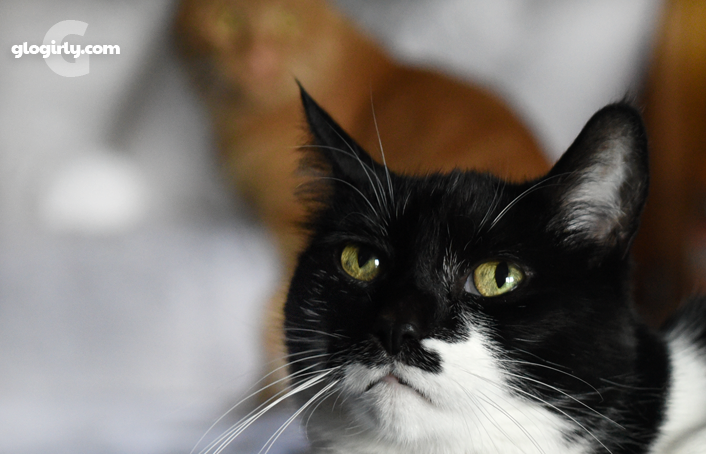 I can see Waffles licking his chops in the background! That bucket sure looks clean. Don't eat too much of it Waffles. It'll stick to your ribs!